Footwear can play a fundamental role in terms of a successful patient outcome. 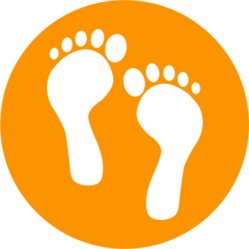 Footwear provides an environment not just for the foot to function more appropriately but also often can provide the environment in which an orthotic can work to its maximum potential. One of the criteria in regard to footwear selection is its suitability in terms of width, depth and length and this can help improve a number of the forefoot problems we see in particular. The space within a shoe can often be utilised to incorporate a functional orthotic which as mentioned previously is designed to reduce physical force going through injured tissues or joints. Footwear can also provide a foundation in regard to the sole of the shoe itself in relation to incorporating the right mechanical profile. Over the last decade we have looked at how footwear and the shoe profile of the footwear can help improve some of the more obvious trauma related injuries such as ankle fractures, to improve patients walking patterns and also improve their level of symptoms more locally. Footwear modification is a key role to how we manage a number of out more complex foot and ankle related injuries, and the Team over the last decade have looked at objective support for some of the interventions that we utilise.